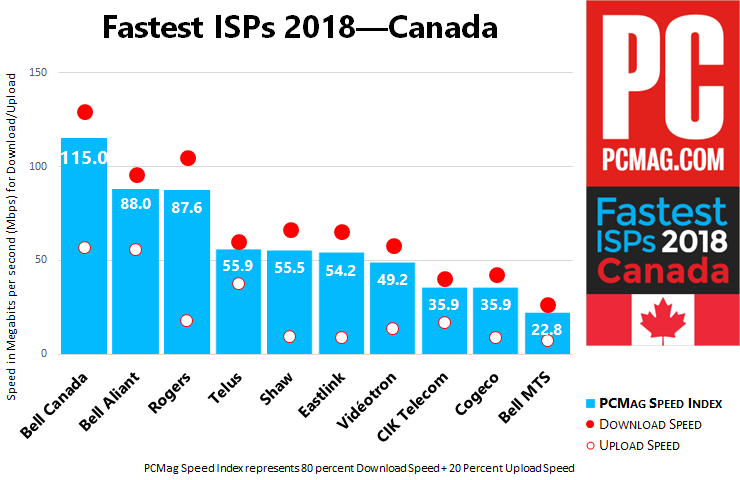 PCMag has released their report on the Fastest ISPs in Canada for 2018, and Bell has taken the overall spot this year, taking the crown away from Rogers. We concentrate on an ISP’s throughput up and down, recorded in kilobits per second, which we divide by 1,000 to get to Megabits per second, or Mbps. We take 80 percent of the download speed, 20 percent of the upload speed, and add those to generate a PCMag Speed Index (PSI). That number makes it easy to perform an at-a-glance determination of exactly which ISP is the fastest, as well as make quick comparisons to results from previous years. This year, Bell Canada garnered a top score of 115, with its subsidiary Bell Aliant in second at 88, Rogers in third at 87.6 and Telus at 55.9, followed by Shaw at 55.5 to round out the top five. According to PCMag, Bell more than quadrupled their PSI score of 27 from last year, mainly due to the success of Bell Fibe, the company’s fibre-optic network. But all over ISPs also increased in speed, as Telus went from 22 to 55.9, Shaw from 30.3 to 55.5 and Eastlink from 37.8 to 54.2. Which ISP are you using right now? Are you happy with your download speeds?